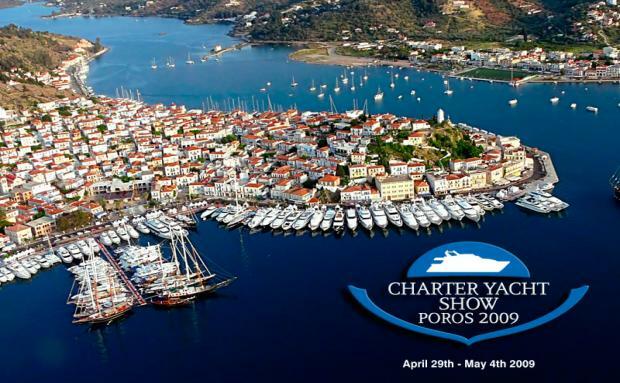 On the schedule I should be in Greece today visiting Siren's Resort, Argonautical Park, at the Poros Yacht Show, or one of the several current Greek entries to the GeoTourism Challenge "The Power of Place." Instead I am taking consolation in the fact that the Internet changes geography and am "traveling" today via Denise Vogel's Outside Sales Network (OSSN) Blog. OSSN is the professional association for hosted travel agents and Denise has been exploring the benefits of social networking apps (Web 2.0). If you are a travel agent - or just interested in developments in the field - OSSN is a good resource and Denise's blog is shaping up be informative. Another positive outcome of this foreshortened European jaunt was to have been contacted by Pete Kercher, Ambassador for EIDD - Design for All Europe. In his latest news note he reminds readers of the EDD Stockholm Declaration 2004. It was adopted on 9 May 2004, at the Annual General Meeting of the European Institute for Design and Disability in Stockholm. The document follows in English but is available in numerous other languages here. Soon after its establishment in 1993, the European Institute for Design and Disability (EIDD) developed the mission statement: "Enhancing the quality of life through Design for All". After ten years as the European platform on Design for All, involving the development of external relations and an internal structure - national member organisations, corporate members and individual members now in sixteen European countries - EIDD believes that the time has come to issue a Design for All Declaration. Design for All has roots both in Scandinavian functionalism in the 1950s and in ergonomic design from the 1960s. There is also a socio-political background in Scandinavian welfare policies, which in Sweden in the late 1960s gave birth to the concept of "A society for all" referring primarily to accessibility. This ideological thinking was streamlined into the United Nations Standard Rules on the Equalization of Opportunities for Persons with Disabilities, adopted by the UN General Assembly in December 1993. The focus of the UN Standard Rules on accessibility in a clear equality context has inspired the development of the Design for All philosophy, which became a generally accepted concept in EIDD at its Annual General Meeting in Barcelona in 1995. Across Europe, human diversity in age, culture and ability is greater than ever. We now survive illness and injury and live with disability as never before. Although today's world is a complex place, it is one of our own making, one in which we therefore have the possibility - and the responsibility - to base our designs on the principle of inclusion. Design for All is design for human diversity, social inclusion and equality. This holistic and innovative approach constitutes a creative and ethical challenge for all planners, designers, entrepreneurs, administrators and political leaders. Design for All aims to enable all people to have equal opportunities to participate in every aspect of society. To achieve this, the built environment, everyday objects, services, culture and information - in short, everything that is designed and made by people to be used by people - must be accessible, convenient for everyone in society to use and responsive to evolving human diversity. The practice of Design for All makes conscious use of the analysis of human needs and aspirations and requires the involvement of end users at every stage in the design process. The European Institute for Design and Disability therefore calls on the European institutions, national, regional and local governments and professionals, businesses and social actors to take all appropriate measures to implement Design for All in their policies and actions. One of the surprise bonuses of our recent trip to Milan for the Carlo Besta Institute congress on tourism and disability was an invitation by Sebastian, the CEO of TripWolf, to attend the launch of their Italian site. Unfortunately I was unable to attend but here he posts some impressions of the event. Our retreat to recuperate at I Girasoli (click to see location on Google Maps), the Tuscan vacation spot developed by the Italian MS Society, includes a restaurant with an excellent selection of wines. Of course there is dessert and wine. Being not far from the source of so many good wines we enjoyed a Brunello and shared a Proseco given as a gift by Paolo Cosulich the night we stayed at his Hotel Sansebastiani Garden in Venice. The wine was from his family vineyard. A local tradition that we were introduced to was adding a bit of strawberry liquer to Proseco. Quite sweet and not to my taste but all part of the cultural immersion experience. 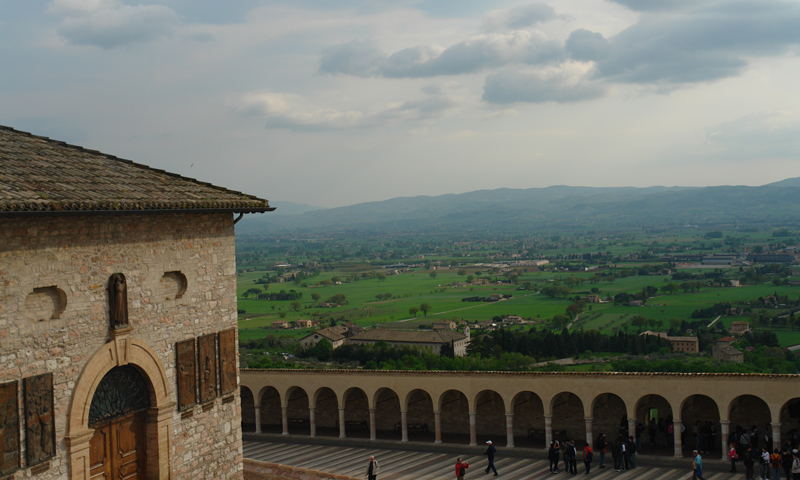 Assisi is not the sort of topography for leisurely strolls if you use a wheelchair. For those of us with a special interest in St Francis the physical exertion of visiting the hillside town outweighs the difficulty of doing so. Then there is the added pleasure of the commanding vistas over the Tuscan landscape. This travelogue picks up long into the journey due to an unexpected injury preventiong me from posting. A small abrasion on my hand became so severely infected that it requires daily injections of anti-biotic and anti-inflamatory. Touring again is appealing after two days post-conference for recuperation in Venice and now north of Florence near Lucignano at the resort complex for the Italian MS Society. La Casa Vacanza I Girasoli , the Sunflowers Vacation Resort, is a barrier-free venue. It has a restaurant that serves local foods as well as special diets. They have six electric scooters to lend, several tiny adapted cars to borrow, and a lift-equipped bus with a driver to rent for private tours. The grounds and countryside and vistas are beautiful - if you can get yourself our of the house restaurant and its excellent wine collection with enough time to enjoy them. Even on the road great projects and resources find me and deserve publicity. I pass along two announcements. One is a study unerway by Gary Scott Danford. The other is a call for input from the US FAA to the industry on aircraft boarding equipment. Thank you for your past participation in the Built Environment Research Project's recently completed Problematic Activities Surveys. In these online surveys, over 600 of you representing a wide range of functional and sensory abilities identified the activities that pose the greatest problems in three built environments: public buildings, public streets and residential environments. You are now being invited to participate in the research project's follow-up Design Effectiveness Surveys in which you will be given the opportunity to evaluate how effective certain designs are in resolving several of those problems. These brief online surveys can be found on the research project's website at Trang web cá cược trực tuyếnhttp://udeworld.com/surveys/built-environment.html. As an expression of our appreciation for your participation in this research project, all participants will again be eligible for random drawings of ten cash prizes ranging from $100 to $500. If you belong to other forums or listservs, or know of anyone else who might be interested in participating, please feel free to give them the research project's website address listed above. * This study is being conducted by the Center for Inclusive Design and Environmental Access (IDEA) through its Rehabilitation Engineering Research Center on Universal Design and the Built Environment (RERC-UD) with funding provided by the National Institute on Disability and Rehabilitation Research (NIDRR). While the Carlo Besta Institute conference "Neurology in the Third Millennium" is not about Health Tourism per se there is room for some interesting convergence with Health Tourism and studies and projects we develop to follow the conference. Reading Constantine Constantinides' reports on the World Health Tourism Congress in Manila and the second European Congress on Health Tourism in Budapest was enlightening. And for those of you who want to pass the time (passa tempo), some etymology. The word Tourism is derived from Tour - from Anglo-French tur, tourn turning, circuit - a there and back journey. Travel may not include a "back". The World Tourism Organization defines tourists as people who "travel to and stay in places outside their usual environment for not more than one consecutive year for leisure, business and other purposes. In 1976 the Tourism Society of England defined Tourism as "the temporary, short-term movement of people to destinations outside the places where they normally live and work - and includes movements for all purposes." In 1981 the International Association of Scientific Experts in Tourism defined Tourism in terms of particular activities selected by choice and undertaken outside the home environment. With discussion of the Airline Passenger's Bill of Rights fresh in my mind and the situation of Rajeev Rajan recently in my writing I fly early tomorrow from San Jose, California to Milan, Italy to address the Carlo Besta Neurological Institute's conference on travel and disability "Neurology in the Third Millennium." Patient/citizen and accessible tourism: what is important to know? Quality of life in illness causing severe disability: utopia or reality? Following a 2007 visit to South Korea the magazine Co-Walking asked me to write this review for the Korean disability community.